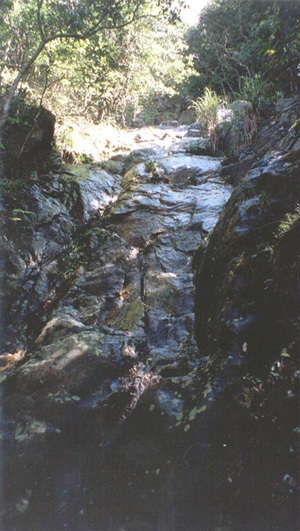 East Dragon is an energy demanding river. 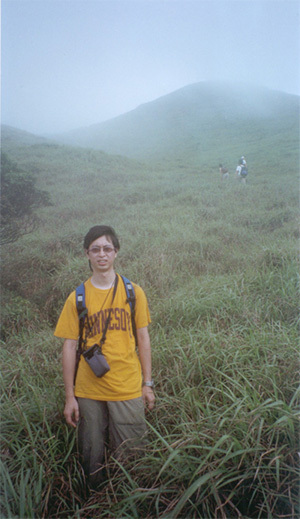 It extends from the botton of Wong Lung Hang to the very top of Sunset Peak. 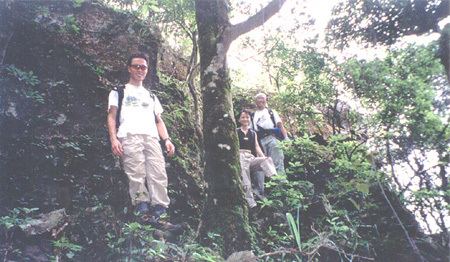 The vertical climb is over 700m, which is the highest jump among all the Dragons in Lantau. East Dragon's entrance starts at an attitude of 75m. After you walk up for 8-10 minutes or so, you will discover at 100m a dam in front of you. At 175m, you will discover the first cliff which is around 20 m. You can climb from the right side. You may also attempt to go up on the left side of the cliff with ropes and safety devices. And then you will approach a series of short cliffs. When you overcome the cliffs, you suddenly reach a "rest" place. You can find a big stone on which you will find the two words "Big elephant". 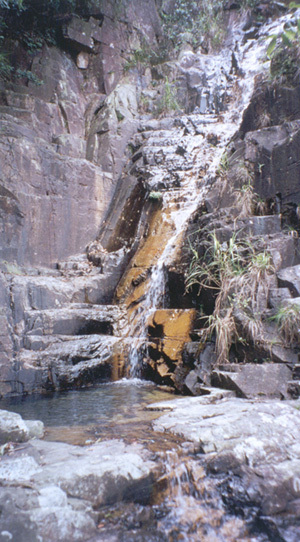 East Dragon is densely covered by trees and shrubs, and most pools are located in the lower course of the river. A few steps after the big stone, you can find the first pool where you can swim. Over 400, you start to go into a remote forest where you can find a lot of untouched trees and plants. However, this is only half of the journey. To go into it is a demanding task for beginners. 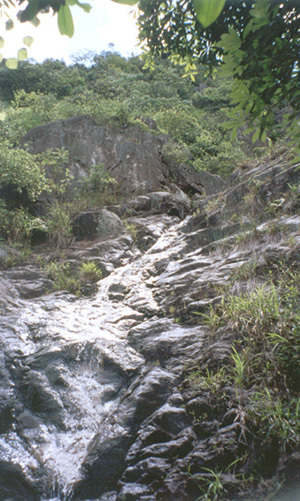 Probably it is the last waterfall you will see. Although it is pretty high up the hill, the river is relatively wide. The path is relatively dark though. As you go along, you will discover the stone steps grow bigger and bigger. 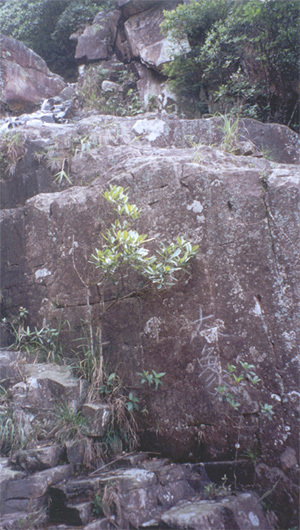 It doubles the energy you spend to climb up the river. And this river shows no sign of leveling after the point. This is rare for rivers in Hong Kong. This is a critical point. 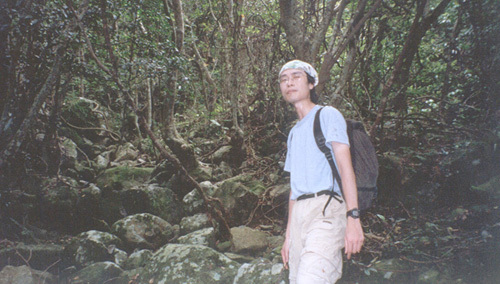 You have to look to the right side (shown on the photo), and find a very narrow path to leave the forest and river. You may miss the exit easily. There is no ribbon indicating the exit. There seems to be continued big stones ahead and you can still climb safely under the end of the river. After you walk out of the river, you can see the Lantau trail 20m ahead of you and see the clear sky. At this point, even the most skilful hikers may feel a bit tired here. Hikers may endure the long journey but climbing the big and very slippery stones (with moss on them) inside the forest after 500m may use up a lot energy.